Olympus' new C-5500 Sport Zoom incorporates a wealth of features including a 5.1-megapixel CCD, a large 2-inch LCD, world-class 5x optical zoom lens, and an inspiring array of manual and automatic functions. The combination of advanced features and intuitive operation enables users of all skill levels to achieve their precise creative goals. The C-5500 Sport Zoom gives users that extra bit of manual control for capturing perfect snapshots along with the power to create digital masterpieces. Getting started with the C-5500 is as easy as popping in the batteries and turning it on. And once it's on, everyday users will appreciate that the C-5500 includes a full range of basic photography functions. With the Full Auto mode, even beginners can take perfect photos without worrying about complex settings. More experienced digital photographers will appreciate being able to have control over basic settings such as exposure, aperture and shutter speed with the Program Auto, Aperture Priority, Shutter Priority, and Manual Exposure modes. For taking quick and precise photos in a range of different lighting situations - such as at night, in candlelight, at the beach, or at sporting events - with optimal aperture, shutter speed, white balance, color saturation and flash setting, users can select from 15 fully automatic shooting modes. Users can also create up to four My Mode settings for additional customization through self-defined combinations of white balance, sharpness, contrast and other settings in an easy-to-view histogram function. The C-5500 Sport Zoom features a 5x optical zoom lens (f2.8/f4.8 - f8.0, 38mm - 190mm equivalent) designed to maximize the imaging potential of its high-resolution image sensor. Incorporating all-glass lens elements, which include three high-index lenses and two lens elements that are aspherical on both sides, the camera's compact "multi-variator" lens unit delivers low distortion and reduced chromatic aberration. For close-up photographs with intricate detail, the Super Macro mode enables shooting from as close as 0.8", filling the frame with dramatic detail and extremely shallow depth-of-field. The C-5500 Sport Zoom also features a new "anti-shake" function for enhanced stability when shooting QuickTime® Movies of television-quality 30 frames-per-second with sound. Olympus' exclusive TruePic TURBO™ Image Processor suppresses noise and boosts image definition to deliver sharper, clearer images with excellent color definition. The fast startup of less than one second and nearly instant shutter release time ensure high-speed response, so you can capture precisely the image you set your eyes on. A burst mode of 2.7 frames-per-second makes this camera ideal for capturing fast-paced action. The body of the C-5500 Sport Zoom is designed to be compact while offering a high degree of functional operating ease. Measuring just 4.9" W x 3.3" H x 3.9" D and weighing 8.6 ounces, the C-5500 is ergonomically designed to fit comfortably your hand for long photo sessions. The large, bright and viewable 2-inch LCD monitor with 115,000 pixels of resolution provides easy viewing when composing or reviewing images. This large monitor comes in handy when using the camera's Direct Histogram function that provides real-time access to exposure information so users can confirm exposure before snapping the picture. A histogram displayed on the LCD with red and blue highlighting to indicate over- and under- exposed areas makes detection of overly white and blacked-out areas simple. Connecting the C-5500 Sport Zoom to a computer is easy with the USB Auto Connect feature, which connects directly via USB 2.0 cable and requires no software. Or, if you prefer, forget the computer altogether. The power of PictBridge technology enables photos to be printed directly from the camera with any PictBridge-enabled printer, such as the Olympus P-10 Digital Photo Printer, without using a computer. Printing and sharing images is more convenient than ever, and the P-10's photo lab-quality dye-sublimation printing produces archival-quality prints in rich color. OLYMPUS Master™ software provides the ultimate in digital imaging management. An intuitive user interface makes downloading to your computer quick and simple, and images are searchable by date or keyword in the Calendar View. And with one-click editing tools, such as red-eye reduction, images can be touched up before printing or emailing. Online support, templates, firmware upgrades and other user services are just a mouse-click away. Super Macro coverage as close as 0.8"
The C-5500 is available now with an estimated street price of $349.99 (U.S.). 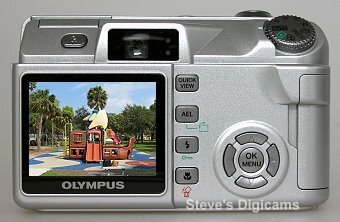 It includes a 16MB xD-Picture Card, four long-life AA batteries, an Auto-Connect USB 2.0 cable, Audio/Video Out cable, wrist strap, OLYMPUS Master Software, user manual and Quick Start Guide. The C-5500 compared to an average CD disc. The C-5500 and Olympus C-7070 Wide Zoom for size comparison. Shutter Speeds 1/1500 sec. - 15 sec. 320 x 240 approx. 24 sec. approx. 48 sec. approx. 774 sec. 320 x 240 approx. 23 sec. approx. 46 sec. approx. 762 sec.